This is a list of all the programs categorized as a Utility. These programs are tools that help you in given situations, from helping you design graphics to doing your laundry! This is a program to create data sheets and read them. You must input a random code of 6 letters/numbers which form your personal ID. It will mace secure that nobody else can read your data sheets on their calculator! File Size: 2453 Bytes Data storage system with personal sheets and bookmark codes. The second version of Mnemon. File Size: 1,144 Bytes The Little Man Computer was designed to teach students how computers work and about assembly language. This is a Little Man Computer emulator for your TI 83. It runs pure LMC machine code with 100% accuracy and full speed. The only difference form this emulator from the real LMC is that this emulator only has 99 mailboxes instead of 100. This is a great program for you if you ever want to learn assembly language. File Size: 928 bytes Balances chemical equations, inputted as a string. File Size: 12 KB A biology program which transcribes basic codons, tells you the amino acid it codes for, and gives the tRNA anti-Codon. File Size: 1,671 bytes A little chemistry that helps determine chemical and physical changes. Includes also a "textbook guide" to the 5 indicators of a chemical change and a built-in help guide. File Size: 1619 bytes Byte Converter allows you to convert between units of memory from the bit to the terabyte, even nybbles. The units follow the IEC standard of Kibibytes, Mebibytes, and so on, but are written as Kilobytes, Megabytes, and son. This is a multivariable hash function that I created. Its pretty fast (especially on a computer), and can have outputs of any size greater than 8 (any less is ridiculously insecure, although a simple edit to the program will allow for any output size greater than 0). However, due to the limitations of the 83/84, 256 is the max inputs and outputs for the moment. The outputs are stored in Str1, so they can be recalled. There has been no editing of anything except for the files included in this download. PS. Any help in analyzing this algorithm is most welcome and greatly appreciated. File Size: approx. 4500 bytes A VERY upgraded version of Mnemon with better interface and remembering utilities. File Size: 1992+767 per slide The ultimate slide editor, viewer, and slideshow presenter. Allows for complete manipulation of any picture you want to view and easily allows for cool little presentations. Includes design templates and clip art. File Size: 10628 bytes This program contains all United States presidents and info on each of them. It is great for History class! File Size: 1500 bytes A program containing a digital timer and a digital and analog clock. File Size: 490 bytes This program will factor quadratic equations equal to 0, and it can factor quadratic expressions. 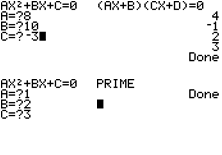 The program identifies GCF and prime quadractic polynomials. File Size: 319 Bytes With the input of any two terms of a geometric sequence, and a desired term, the user can receive two outputs: the value of the desired term, and the sum of all terms from the first term to that one. For example: if you only knew the first and the third terms of the geometric sequence 1,2,4,8, and you wanted to find the fourth, you would first enter 1 and 3 for first and third terms, and then their respective values, 1 and 4. Then you would enter the term you wanted, 4 for fourth term, and two numbers would be displayed: 8 (the fourth term) and 15 (1+2+4+8). File Size: 858 Bytes A simple conversion system between bases 10 and 2. File Size: 752 Bytes Solves systems. And quadratics.